In Matthew 27:11-26 we read about the event depicted in this painting. After the rushed ‘trial’ of Jesus the Jewish leaders handed him over to Pilate, the Roman governor of the province. Jesus did not defend himself against any accusations and Pilate, urged by his wife, tried to find a way of releasing Jesus. The crowd shouted, ‘Crucify him,’ and, afraid of a riot, Pilate symbolically washed his hands of the blood of Jesus, passing responsibility for his death to the crowd. He then released Barabbas and handed Jesus over to be crucified. In the painting we see Pilate washing his hands, an act that would earn him a notorious place in history. Jesus, with a crown of thorns, is led away. He has a rope around his neck and the cross is already on its way outside the city via the Roman arches. The crowd looks on eagerly. To the left is a mysterious figure who may be Barabbas – if so he is looking at the man who died on the cross intended for him. The serving boy holding the ceremonial plate gazes intently at Pilate’s face, while the serving girl, having provided the water, lingers to watch this moment of history. An old soldier seems resigned and unsurprised by Pilate’s decision. Perhaps he will be responsible for the execution, having guarded Barabbas to this point of time. On the other hand he may be responsible for law and order in the city of Jerusalem. Pilate alone gazes at us with a piercing look. There is a sadness mixed with inquisitiveness, as if he is inquiring what we would have done in the same situation. In looking at us he is turning away from Jesus, but the predominant colour of the picture, red, will not let us forget that the lifeblood of Jesus is soon to be shed. The sky itself provides a crimson background to the sad scene. Not all the water in the world could wash away the responsibility for this man’s blood. But Pilate’s gaze engages us. Could it be that we bear some responsibility too? 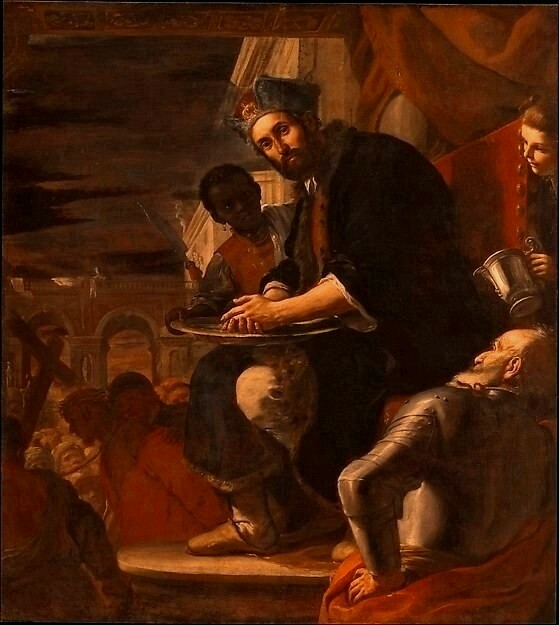 Mattia Preti: Pilate Washing his Hands, 1663, oil on canvas, 206 x 184.8 cm. Metropolitan Museum, New York. Mattia Preti (1613 – 1699) was an Italian painter who travelled widely in Europe. It was through his mentor, Guercino, that the influence of the Venetian school, including Caravaggio, came. He painted religious scenes in churches in Rome, the Carthusian Chapel in Naples and also frescoes for the Cathedral at Valletta, Malta, where he lived for the last 40 years of his life. He was versatile, working in fresco, on canvas and altarpieces, and was particularly at ease with religious works exploring emotions and reactions to significant events. Keith J. White is the leader of Mill Grove, a Christian residential community that has been caring for children and young people in the East End of London UK since 1899. His first degree was in English at OxfordUniversity and he has retained a love for literature, music and art “to the greater glory of God.” He has written or edited a long list of books, among them The Changing Face of Child Care; The Art of Faith; and Now and Next. He led the team that produced a new international Bible (The Bible Narrative and Illustrated, 2008) designed for those outside the This meditation was taken from the book Masterpieces of the Bible. Insights into Classical Art of Faith by Keith J. White (Baker Books 1997). church and Christian faith. This incorporates 500 illustrations into the overall design. Keith teaches the theological foundations module of Holistic Child Development at Malaysia Baptist Theological Seminary in Penang, Malaysia. He also contributes to conferences, symposia and publications around the world. He is an Associate Lecturer at Spurgeons College, and a member of the faculty of the Asian Graduate School of Theology.